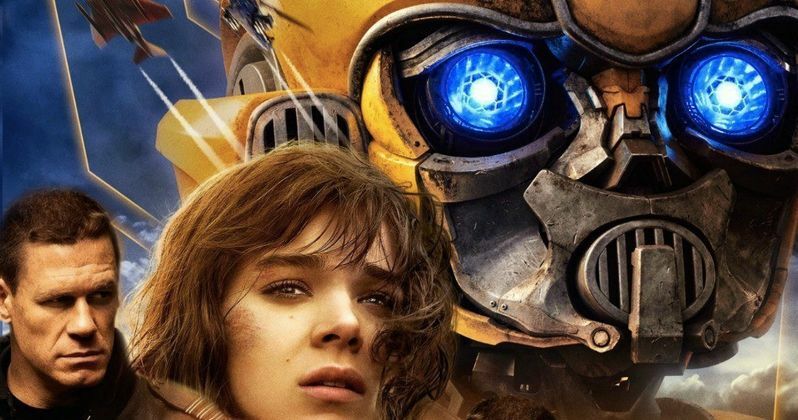 A brand new poster for Bumblebee has rolled out ahead of the movie's rapidly approaching release date. The previous posters have largely focused on the "girl and her car" story that is going to unfold this Christmas. This time around, it's a much more modern look at the upcoming Transformers spin-off, which tries to cram a lot into a single image. But it does pay some needed attention to the movie's human characters, including John Cena. The poster gives a backdrop of San Francisco, with our main character Charlie, played by Hailee Steinfeld (Pitch Perfect) hanging out with Bumblebee in his classic 80s VW Bug form off to the side. The main focus is on the three giant floating heads, which include Charlie, Agent Burns, played by wrestler-turned-actor John Cena and the titular Autobot, with a yellow Autobot symbol surrounding them. We also see the main Decepticon villain of this movie, Blitzwing (who many thought was going to be Starscream) in his fighter jet form flying off to the left-hand side of the poster. Paramount was put in an interesting situation following the release of Transformers: The Last Knight last year. The movie made a full $500 million less worldwide than its predecessor, Transformers: Age of Extinction, signaling that audiences were growing tired with what director Michael Bay has to offer after making five of these massive scale action flicks. The studio decided to scale things back a bit by focusing mostly on one character and bringing down the stakes slightly, in order to pay more attention to character and story. Those aren't exactly Michael Bay's strengths as a filmmaker. So, Travis Knight, who previously helmed the animated Kubo and the Two Strings, stepped in to become the first person other than Bay to direct a Transformers movie. As we've seen in the trailers, not only is the movie set in the 80s, but many of the robots in disguise will be showcased in their classic 80s look, including Optimus Prime, who isn't set to be a main character, but looks glorious nonetheless. We've also seen that we're going to get our best look at Cybertron to date, which should be very appealing to longtime fans even of the franchise. Even those who haven't enjoyed the live-action version up to this point. Perhaps the only problem is that Bumblebee will be facing down some very stiff competition at the box office. Also arriving on December 21 is Warner Bros.' Aquaman, which is also looking to course correct for the live-action DC universe. Luckily, the Will Ferrell and John C. Reilly comedy Holmes and Watson decided to move to Christmas day recently, providing a little less direct competition. The real test is going to be how these movies do with critics, which we should be learning sooner rather than later. Be sure to check out the new poster from the Bumblebee Movie Twitter account below.